With the summer yachting season on the horizon, the industry experts at Sunreef Yachts Charter were on the scene at the April Florida Yacht Brokers Association Charter Yacht Open House at Bahia Mar to inspect some of the latest offerings available for charter in New England, the Bahamas, and the Caribbean. 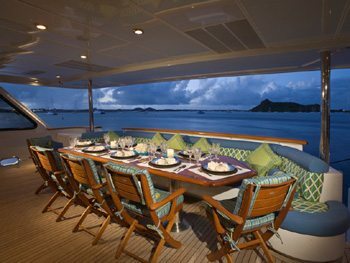 At the highlight of the event was our visits onboard charter yachts OHANA and ATLANTICA, both truly exceptional in their offerings, they feature luxurious and plush living areas, outstanding deck areas, and impeccable crews. Our tour of OHANA exceeded our expectations and we are sure it will exceed yours! She is exquisitely designed inside and out and is a great choice for holidays spent with friends and family alike. Upon our visit onboard, we were met by the gregarious Captain John Drugach from Vermont. He has over 25 years of industry experience and being from the area has extensive familiarity with all of the best New England ports. Both he and his crew are top-notch! A sampling of Chef Alicia Clough’s classic New England cuisine consisting of mini lobster rolls, clam chowder and oysters on the half shell were completely and utterly delicious! The bright and airy interior is spacious and impeccably decorated. The elegantly-appointed full-beam master stateroom features exquisite furnishings. 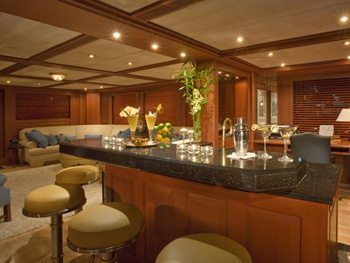 The supremely open sundeck with bar has lots of lounging space. OHANA is at the top of our lists for an incomparable charter holiday in the charming New England summer hotspots of Newport, Martha’s Vineyard, Block Island, and Sag Harbor and is available at the weekly rate of $140,000 plus expenses. 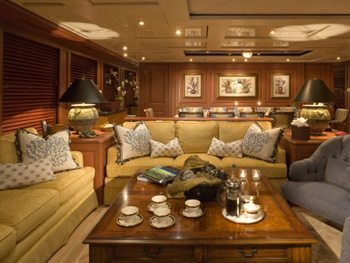 Also receiving our stamp of approval at the open house was ATLANTICA, an outstanding charter yacht that we highly recommend for guests looking for a lavish getaway in the most opulent of settings. The excellent crew pulled out all the stops during our visit onboard, entertaining us in the handsomely designed sky lounge. Captain Trevor KC Caulfield was charming and earns a well-deserved reputation for his local knowledge of the Bahamas cruising grounds. We also give him accolades for his mean mixologist skills after sipping on one of his mini Margarita best recipes ever! Not failing to impress us was the culinary prowess of Chef Gabriel Hanlen and his delectable selection of small bites including seared tuna, sweet and sour chicken and awesome little chocolate brownies topped with hazelnuts. The richly-appointed interior is elegant and sophisticated. The sky lounge was designed for entertaining at its finest. The perfect setting for an enjoyable alfresco meal. 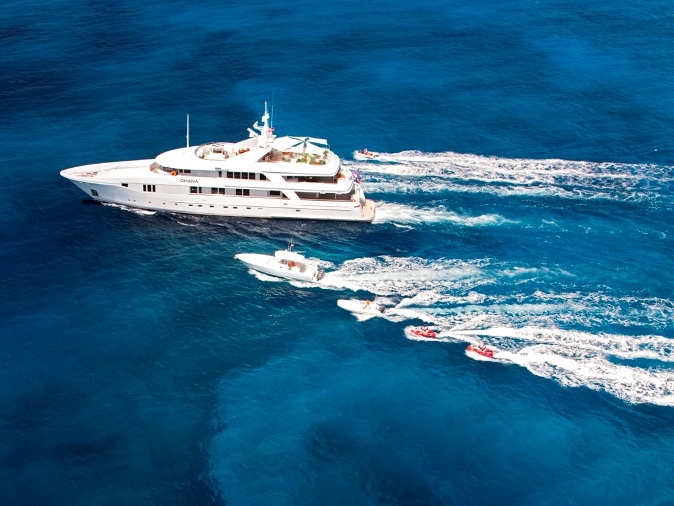 A showcase beauty with an impressive list of features, mega yacht ATLANTICA is a superb option for cruising the Bahamas, Florida, and the Caribbean in style and luxury. 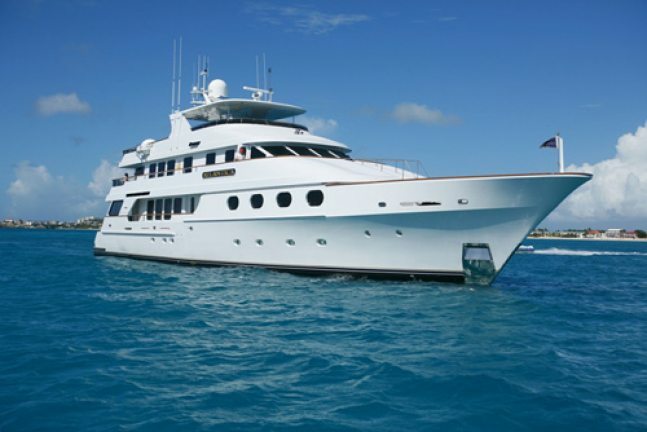 She is available for charter at the weekly rate of $115,000 per week plus expenses. For more information about chartering OHANA or ATLANTICA, please contact us. 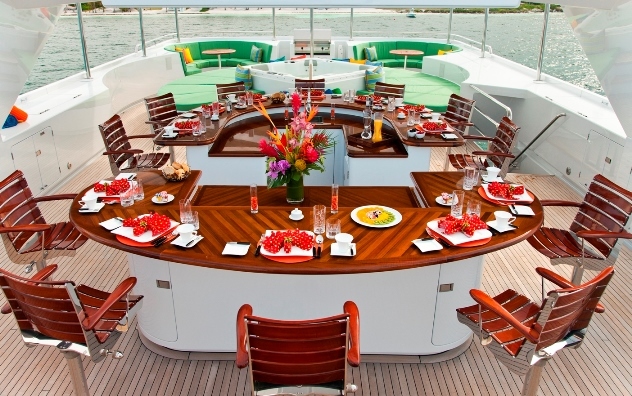 This entry was posted in Bahamas, Caribbean, Mega Yachts, New England and tagged Caribbean Yacht Charters, Charter Yacht ATLANTICA, Chater Yacht Ohana, New England Yacht Charters by sunreef yachts charter. Bookmark the permalink.